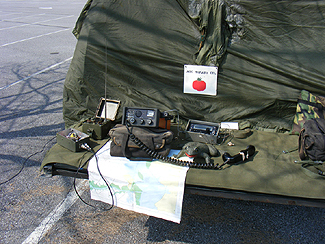 Check in Moose and Squirrel Cold-War Clandestine and Long-Range-Reconnaissance-Patrol Net on 5.3715 Kcs. antennas fed at the end. The "rope" antenna wire is marked at a half wave for 40,60,75 and 80 meters. 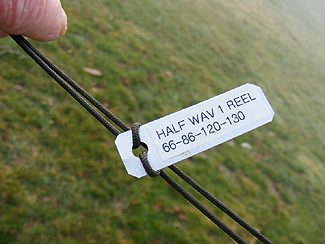 Just reel it out let your fingers find the solder spot on the "wire rope', lock the reel then tie the other end to a tree, clip on a feed line wire at the reel end for your tuner. 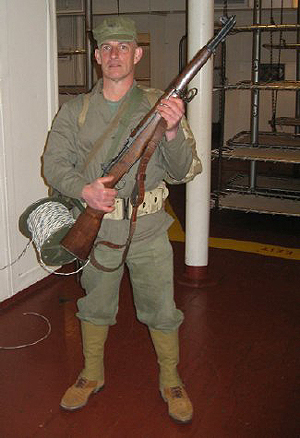 The "rope" wire is available from any of the ham wire vendors. 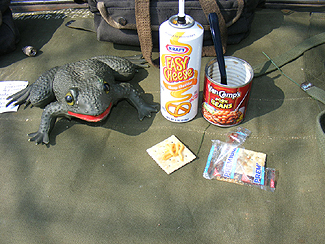 Before checking in to the Moose and Squirrel net and after recovering from the BC-611 ordeal I relaxed with a light lunch. I prefer Kraft "Easy Cheese". 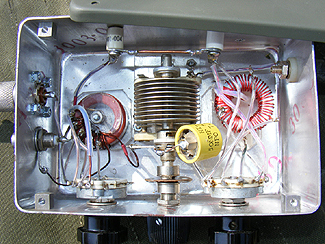 Video: Tuning the Fuchs Antenna Tuner. The Fuchs circuit requires that the tuning capacitor be "above ground" so I mounted my variable cap on a piece of lexan and used an insulated coupling for the shaft. 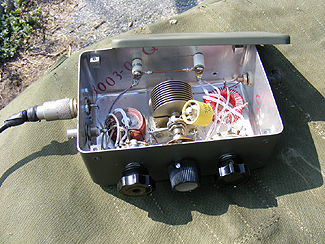 The yellow 40 pF capacitor was added to increase total capacitance of the variable as the original circuit called for 200 pF. 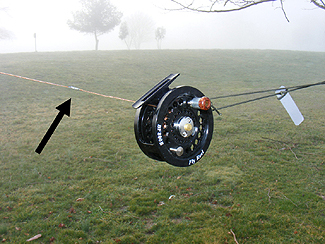 Wrap the output toroid in Teflon plumbers tape for insulation before winding. I do not have an "output indicator" on the tuner as I utilize ME-61 field strength meter to confirm a peak in the tuning. The Fuchs circuit is unique as it offers input tuning as well as output tuning. 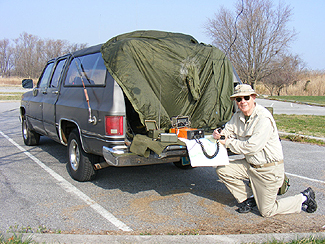 The tripod folds up for transporting and the fiberglass pole telescopes. 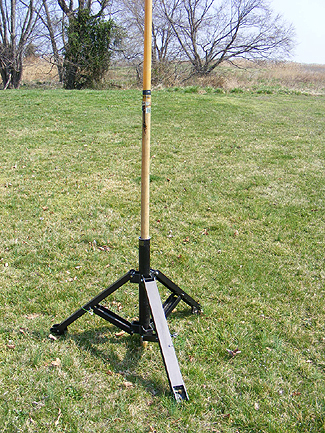 Here the pole is extended in order to raise the center of the half wave for additional height. Equipment in use: Low power SGC-715, crystal controlled but I use an external DDS VFO On the left is the antenna tuner and ME-61 Field Strength meter which can be used as a final touch up to the tuner. When Al N3FRQ came swishing on the frequency, it sounded like a giant signal sucker has arrived and completely quieted the receiver. Video N3FRQ calling the Moose and Squirrel net.